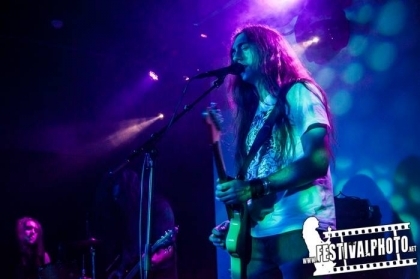 Seems like winter has brought Alcest with it and they were back to Portuguese stages, and they couldn’t have brought better company with them: The Fauns and Hexvessel. This night promised so much and the crowd couldn’t wait much longer. At 10 p.m., right on time, the gigs started with The Fauns, which were ready to deliver a show that no metalhead had ever seen before. Their dream pop quickly mesmerized the crowd that soon was filling Room 2 of Hard Club, especially due to the voice of the lead singer Alison Garner, which transmitted an incomparable harmony and a feeling of warmness and comfort. The rest of the band was constituted by very different people, with a very specific style and that diversity was the most interesting thing to watch because you were able to see that in the difference was their unique music. Hexvessel were next and everyone didn’t know what to expect from the Finnish band, their sound was just too different to know what was going to happen. In the beginning, those who never heard Hexvessel were a little confused with their music but slowly that was about to change. Not a single person was able to resist them, especially to their lead singer Mat McNerney, who had and amazing presence and pushed the public to their maximum. Another presence that surprised us all was from the multi-instrumentalist, Kimmo Helén, which showed that being the guy that plays several instruments it’s as energetic and noticeable as the rest. Songs like I Am the Ritual and Unseen Sun showed that mixing a bunch of different music styles can work, from folk to black metal, you only have to know how to do it, just like these skilled musicians. 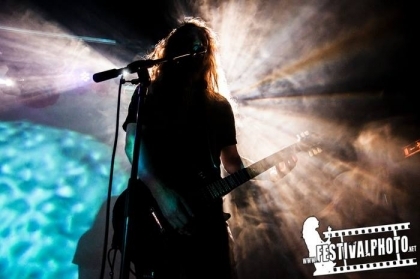 Finally, Alcest. The entire crowd knew that the French are the masters of post black metal and that they can deliver a show that’s magnificent, but to all the presents, since the first second to the last it was just magic. The show started with the intro of their last record “Shelter”, followed by Opale from the same, since it was the album’s tour. Then, in focus were their previous albums, with special attention to Autre Temps and Souvenirs d'un Autre Monde, and right in the middle of them, the gem - Percées de Lumière. Neige, the lead singer, since the beginning showed a little smile that conquered all the girls’ heart but at the same time he always seemed to be a bit distant, but after a while, you noticed that the whole band was just like Neige and that distance that we felt was just a side effect from the ambient that they create, romantic yet cold. When they weren’t playing they were thanking constantly the public for their support and love showing their humble personality.